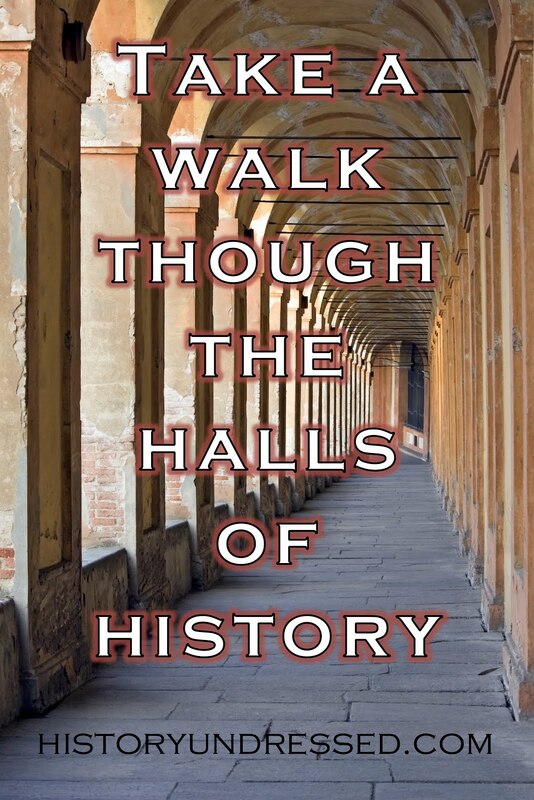 Welcome to History Undressed, guest blogger, Ally Broadfield! 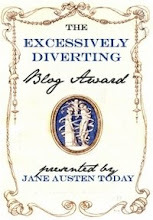 She's written a fabulous piece for us today on The Winter Palace. Enjoy! Magnificently situated on the bank of the Neva River, the Baroque-style Winter Palace not only served as the main residence of the Russian Tsars, but it has also played a central role in the political and cultural history of St. Petersburg. 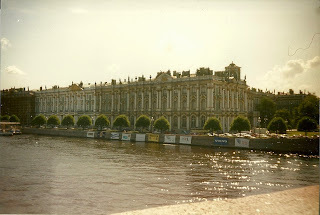 Today the Winter Palace is known as the main building of the Hermitage Museum. The palace has 1,786 doors, 1,945 windows and 1,057 opulently decorated halls and rooms. The first Imperial residence on the site of the Winter Palace was a Dutch-style wooden house build for Peter the Great in 1708. In 1711, a stone building replaced the wooden house. The remains of the stone building formed the foundations of the Hermitage Theatre, but parts of it have been restored and are now open to the public. In 1731, Empress Anna Ioannovna commissioned court architect Francesco Bartolomeo Rastrelli to create a new, larger palace on the same site. Completed in 1735, the third Winter Palace survived for only seventeen years before Empress Elizabeth asked Rastrelli to expand the building. After two years of planning, the empress and Rastrelli agreed to a new design that would completely rebuild the palace. When Catherine the Great took the throne in 1762, the Winter Palace was nearly complete. Though Catherine removed Rastrelli from the project, his designs for the exterior of the palace have remained almost completely unaltered to this day. The building forms a square with an interior courtyard accessed through three archways facing palace square. The lavishly decorated facades feature two levels of ionic columns, and the parapets of the building are decorated with statues and vases. Local regulations prevent any building in the city center from exceeding the palace’s approximately 72 foot height. The statues and vases decorating the parapets. Throughout the eighteenth and nineteenth centuries, continual improvements were made to the interior of the palace. In December 1837, a fire destroyed nearly all of the palace’s interior. Nicholas I ordered that the reconstruction of the palace be completed within one year, a monumental task given the technology of the time. Alexander II was the last of the Tsars to use the Winter Palace as his primary residence. After his assassination in 1881, it became apparent that the palace was too large to be properly secured to ensure the safety of its occupants. 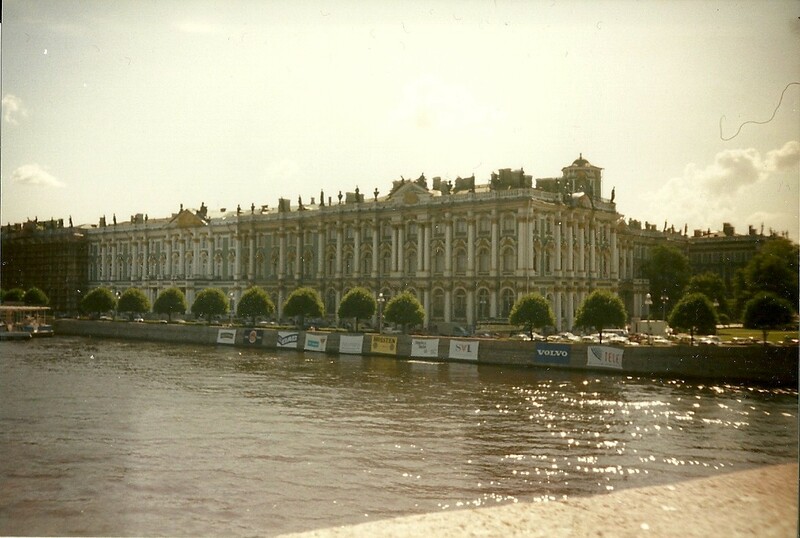 The Winter Palace was still utilized for official ceremonies and receptions. A masked ball commemorating the reign of Tsar Alexey Mikhailovich (the second Romanov Tsar) held in 1903 was the last major event hosted by the Imperial family at the Winter Palace. Palace Square from inside the Winter Palace (including the General Staff Building and the Alexander Column commemorating victory over Napoleon). In 1917, after Nicholas II’s abdication, the Winter Palace became the seat of the Provisional Government under Alexander Krenskiy, and it was against this authority (rather than the Imperial family) that the Bolsheviks stormed the palace. 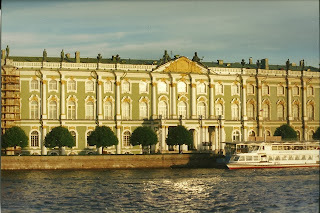 The Winter Palace was declared part of the State Hermitage Museum on October 17, 1917. Though the Bolsheviks originally instituted a policy to remove all Imperial symbols from the palace, after the siege of Leningrad during World War II, an ongoing process of returning the palace to its Imperial splendor began. 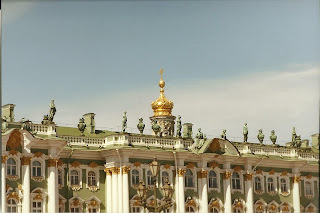 The state rooms of the Winter Palace now form one of the most popular sections of the Hermitage. 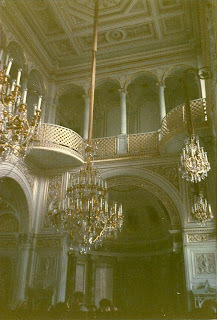 The interior of the state rooms of the Winter Palace. 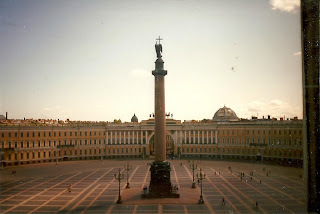 For more information, much better pictures than I took, and even a virtual tour, visit the official website of the Hermitage Museum. There is a special section on the Winter Palace Through the Ages. Norman, Geraldine. 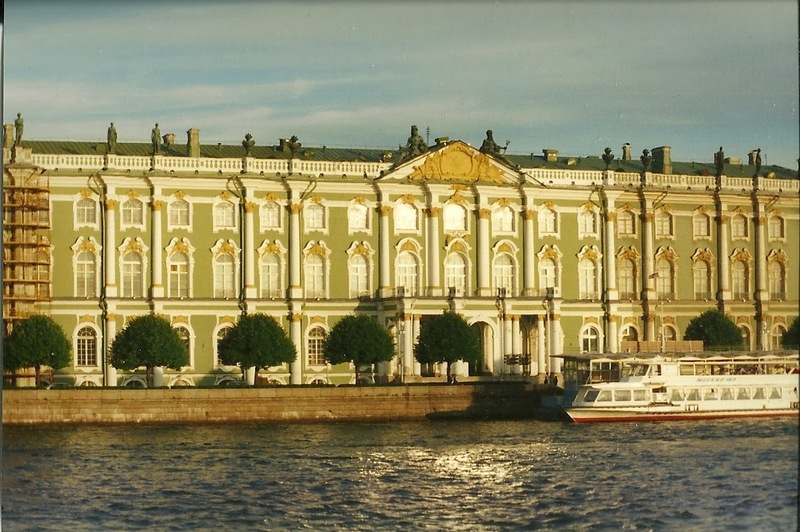 The Hermitage: The Biography of a Great Museum. New York: Fromm International, 1998. Thanks Ally for this informative post. I love those opulent historical buildings! 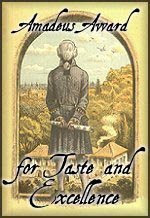 A much-neglected area of historical study. Thank you for the post, Ally! Thanks for stopping by, Carole and Angelyn!There are so many gorgeous palaces in St. Petersburg it's hard to choose which one to write about.